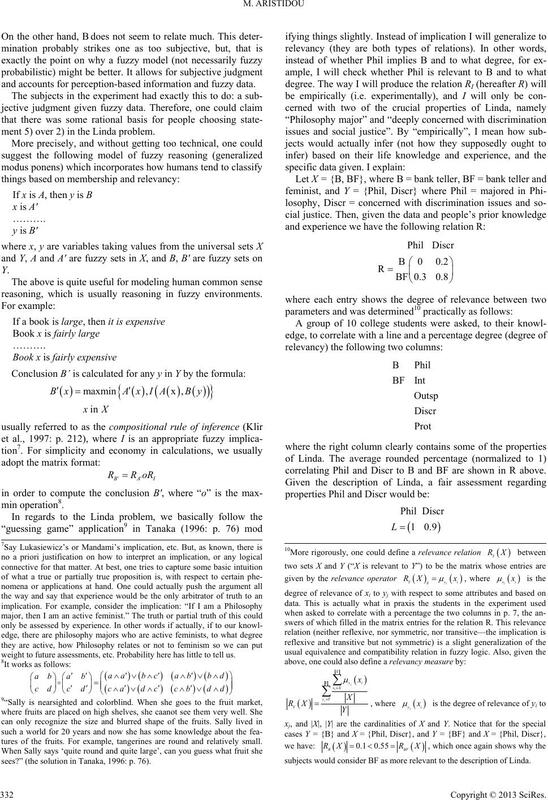 Linda problem is not appropriate, and I suggest different approaches based on fuzzy reasoning models. those answers is clo ser to the permission/obligation schema. as Tversky and Kahneman (1982) revealed, this is not the case. 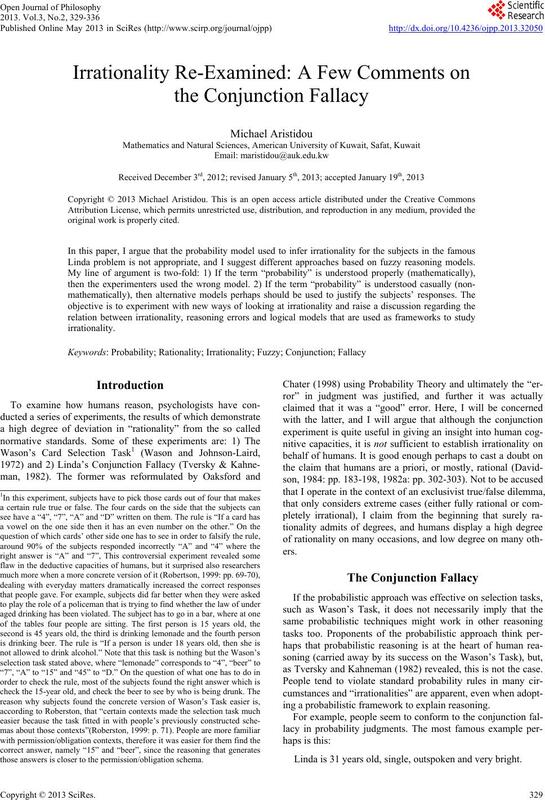 ing a probabilistic framework to explain reasoning. Linda is 31 years old, single, outspoken and very bright. sky & Kahneman, 1982: p. 361). 1) Linda is a teacher in an e l e m e nt a ry school. 2) Linda is a bank teller. 3) Linda works in a bookstore and takes yoga classes. 4) Linda is active in the feminist movement. less likely that the subject is irrational (Davidson, 1982a: p.
through interpretation, demands high degrees of consistency. tion, since the interpreters are the ones most probably mistaken. tance, since the theory turns its back on the empirical results. that it is at least m o re explanatory. considering a non - c l a ss i c a l a p p r oach to the probl e m .
that it is the wrong probability model to account for those data. by the rules of probability”, as the numerous experiments show4. Hillel & Nater, 1993; Tentori et al., 2004). 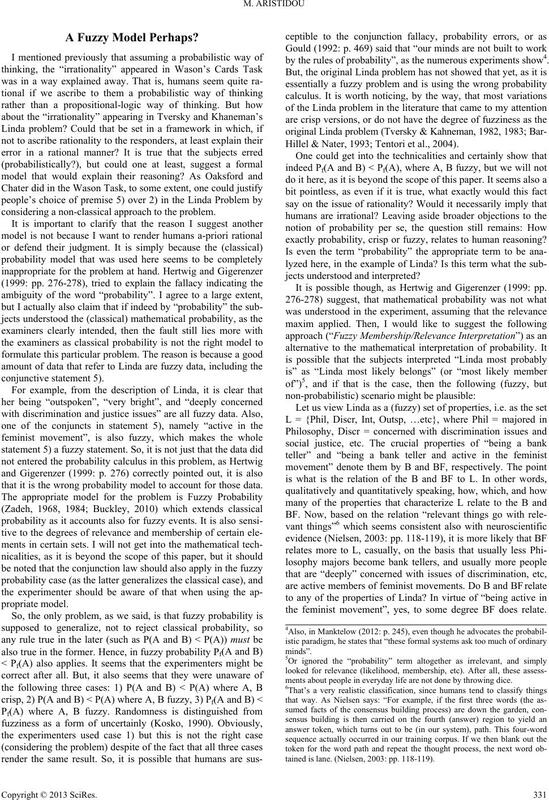 exactly probability, crisp or fuzzy, re lates to human reasoning? It is possible though, as Hertwig and Gigerenzer (1999: pp. the feminist movement”, yes, to some degree BF does relate. ments about people in everyday life are not done by throwing dice. tained is lane. (Nielsen, 2003: pp. 118-119). and accounts for perception-based information and fuzzy data. ment 5) over 2) in the Linda problem. reasoning, which is usually reasoning in fuzzy environments. correlating Phil and Discr to B and BF are shown in R above. weight to future assessme nts, etc. Probability here has little to te l l us . tures of the fruits. For example, tangerines are round and relatively small. sees?” (the solution in T anaka, 1996 : p. 76). 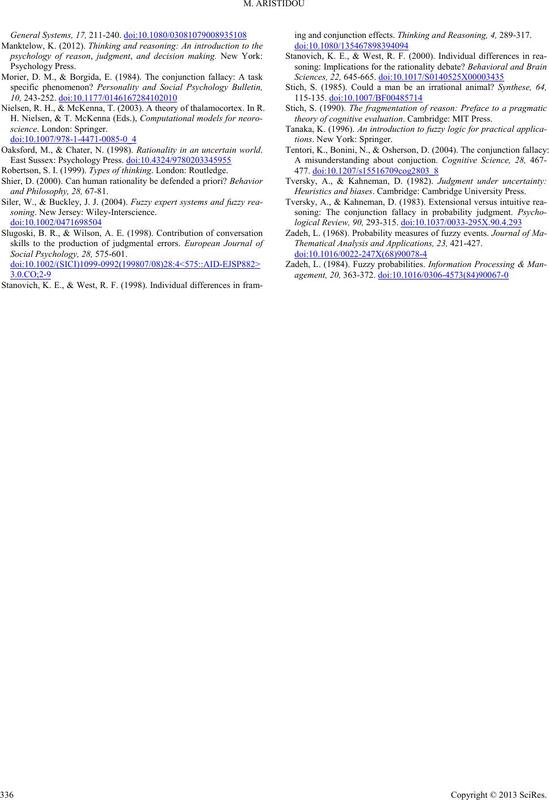 subjects would conside r BF as more relevant to the description of Linda. higher than B, and saw it more possible given the data. knowledge; it is not a problem to be decided by throwing dice. probabilistically is not quite convincing. 1) Linda is an alien. 2) Linda is an alien and is active in the feminist movement. she is an alien or not, in virtue of her properties/qualities. probability outcomes? No, but that is not my point of concern. should accept such a prerequisite. further those results to rationality. Yet, my point still stands. level of theorems is base d on binary logic. I disagree. I believe that the last statement begs the question. then it is only reasonable for one to explore other venues. tion would still remain untouched. 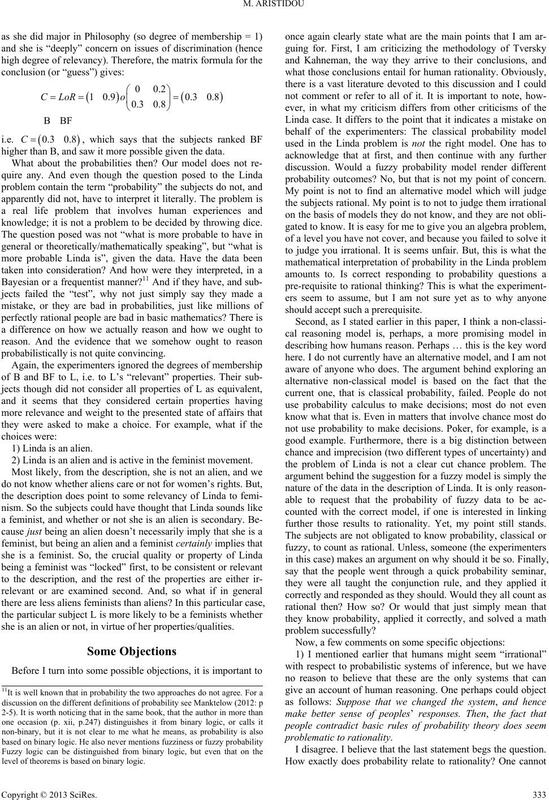 reason and whether their reasoning is rational. Linda being a bank teller or a feminist bank teller? but it is not going to be decided by throwing dice. the experimenters have the obligation to apply the right tools. tellers or not coming from? or casual, philosophical concerns in general, etc. not the question posed to the subjects after all. Yes, but why was the description given to the subjects then? ates beliefs) must have high levels of rationality and truth. plausible argument if one relaxes the demands for consistency. 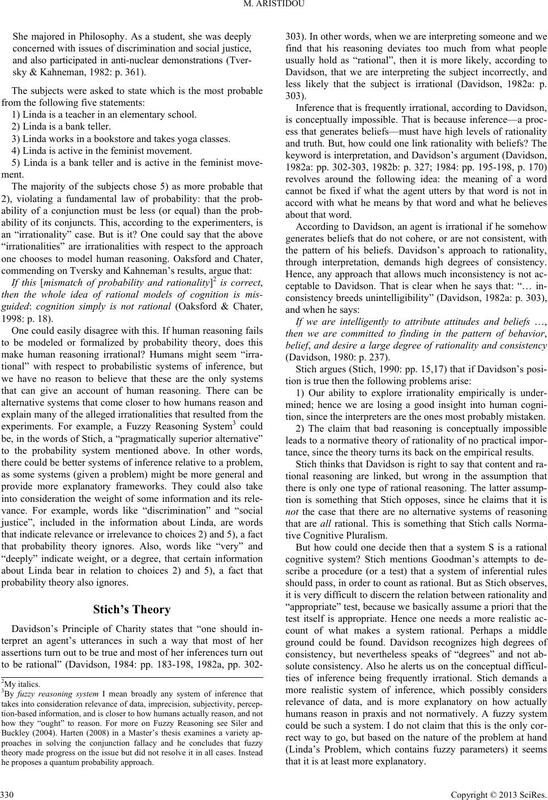 (more general) framework and model to study rationality. been better chess players than the ones who avoided the fallacy. situation (Hilton, 1995: p. 266). vague concepts and respects implicatures. ness and soft computing). New York: Springer. Cherniak, C. (1981). Minimal rationality. Mind, XC, 161-183. Essays on actions and events. New York: Oxford University Press. Davidson, D. (1982a). Paradoxes of irrationality. In R. Wollheim, & J.
Davidson, D. (1982b). Rational animals. Dialectica, 36, 317-327. Davidson, D. (1984). On the very idea of a conceptual scheme. In D.
Inquiries into truth and interpretation. New York: Oxford Press. and memory. Hove: Psychology Press. tory (p. 469). Ne w Yor k: N orton. ity and Social Psychology, 65, 1119-1131. 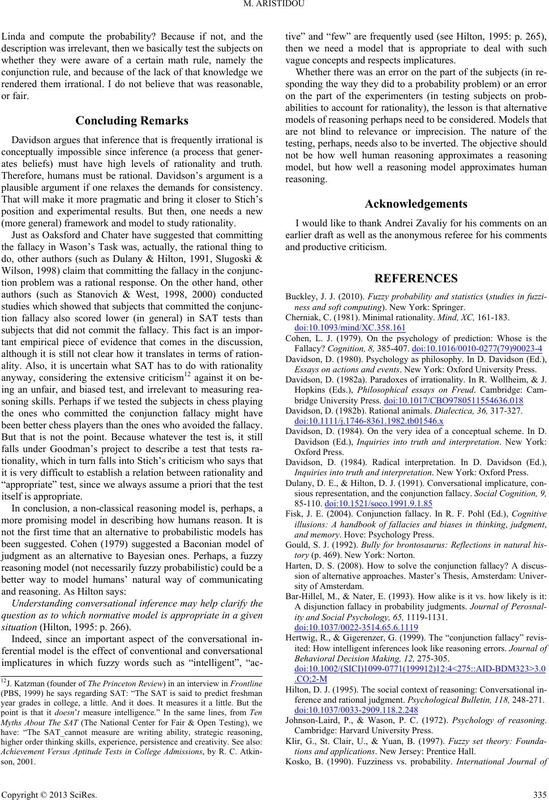 Behavioral Decision Making, 12, 275-305.
ference and rational judgment. Psychological Bulletin, 118, 248-271. Johnson-Laird, P., & Wason, P. C. (1972). Psychology of reasoning. tions and applications . New Jersey: Prentice Hall. Nielsen, R. H., & McKenna, T. (2003). A theory of thalamocortex. In R.
Oaksford, M., & Chater, N. (1998). Rationality in an uncertain world. Robertson, S. I. (1999). Types of thinking. London: Routle dg e.
and Philosophy, 28, 67- 81.
ing and conjunction effects. 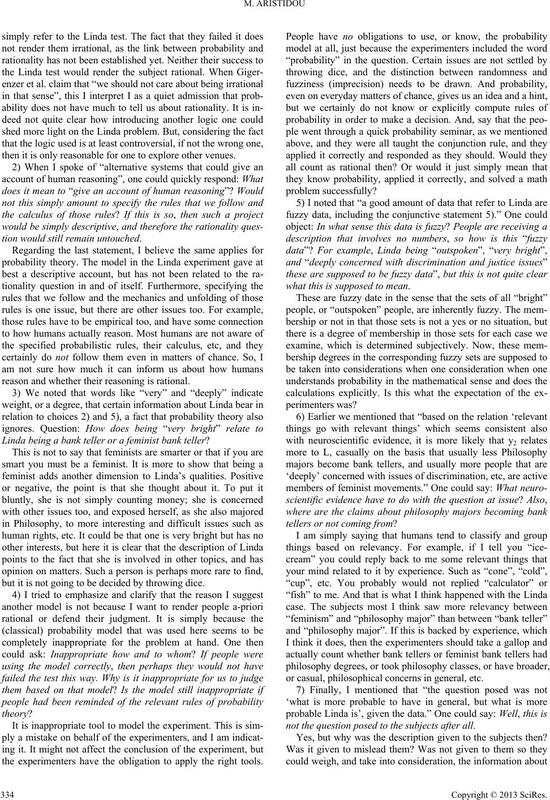 Thinking and Reasoning, 4, 289-317.
theory of cognitive evaluation. Cambridge: MIT Press. Heuristics and biases. Cambridge: Cambridge Un ive rsity Press. Thematical Analysis and Applications, 23, 421-427.